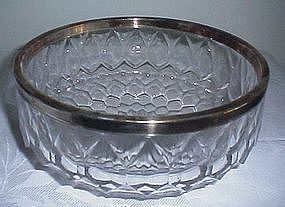 A nice heavy crystal bowl with honeycomb pattern and silverplate rim that reads ASCI, crown between S and C, Silverplate Germany. The adhesive used to hold the silverplate rim on crumbled away and needs to be reglued. Otherwise, excellent condition.